Optimum Security is your full-service security solutions partner in Kimberly, BC. Whether you’re a homeowner looking for a monitored alarm system, a business owner who needs enhanced loss protection assistance, or part of an organization that requires uniformed security officers for an event, we’re here to help. We offer comprehensive security services that are fully customized to meet the needs of the most demanding clients. 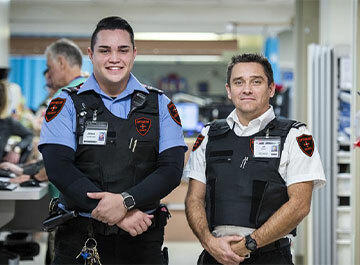 Our extensive resources include a team of professional, highly trained security guards who are fully licensed to provide private protection services in British Columbia. Each of our uniformed officers undergo extensive background checks and advanced training in risk assessment, crowd management, communication, and surveillance, making our officers among the most highly-skilled private security professionals in the world. Our security systems help to keep you, your family, and your home protected against break-ins, fire, floods, and carbon monoxide leaks, 24 hours a day, 7 days a week. We design, install, and provide around-the-clock monitoring for your home alarm system, so you can rest assured knowing your home is always protected. If an emergency should occur, our Optimum Security team will work quickly to dispatch immediate assistance, and we can even speak directly with anyone in your home if your alarm is activated through our hands-free, two-way communication system. As one of the fastest growing security companies in BC and Alberta, we’ve quickly established ourselves as the security provider that discerning home and business owners can count on. For more information about our wide range of professional security solutions in Kimberly, BC, contact us at (604) 644-9229.